Auburn Valley Guest Day & Karen's Big Break Challenge - Deadline to Register is May 3 (More Information Flyer) This will be the Chapter PWGA Team Play Qualifier. This 9-hole league continues year round every other Monday in Roseville. Contact Kathy McKenzie if you are interested in the twice monthly play in Roseville. It's casual 18 holes and always fun!! If you are interested in golfing during the day on Tuesdays, contact Sharon Blume. No weekly commitment required. Casual 9-Hole Play after work at Haggin Oaks, Arcade Creek and the first 9 holes of the MacKenzie course. Tee times start at 5:30pm. Contact Linda Reid to be added to weekly email. No weekly commitment required. After golf dinner/drinks at the MacKenzie Grille. Play begins in April. This 9-hole league is year round every other Friday at Land Park. Contact Marcie Fay if you are interested in the twice monthly play in Sacramento..
Casual 9-Hole Fun Play on Friday mornings at Haggin Oaks. Contact Linda Reid to be added to weekly email. No weekly commitment required. Play is year-round, weather permitting. March 31, 2019 Points Update. Click here for the PDF. To Post Your Scores click the system below where you maintain your handicap index. ---Sign In to LPGA Amateurs to post your scores. GolfNet or GN21 is the system that LPGA Amateurs provides to members. ---NCGA is the authorized organization of USGA for handicap indexing in Northern California. You must be a member of NCGA or PWGA to use this system. ---GHIN is the USGA handicapping network. This covers all organizations that belong to this network. The NETWORK does NOT include GolfNet/GN21. USGA updated Rules of Golf for 2019. -Click Here for a handy reference guide published by LPGA. -Click Here for USGA Videos explaining each new rule. We are in need of 10 to 15 volunteers to be part of our Phone Tree Posse. Make telephone calls to fellow LPGA Amateur members and personally invite their participation in golf, education and special events throughout the year. I'll take up very little of your time plus you'll have the opportunity to engage with members you might not otherwise - and might even find some new golfing partners! Most importantly, you'll have the satisfaction of knowing you made an important contribution to the continuing success of the Sacramento Chapter of LPGA Amateurs Golf Association. WHEN? "Phone Tree Posse" volunteers will occasionally (3-4 times per year) be asked to call 10-15 chapter members to invite and encourage their participation in a specific event - for example, the Annual Kickoff Brunch or a sponsor's social event. WHERE? Calls can be made from the comfort of your home - or anywhere else - that works for you. WHY? We want to ensure that EVERY member benefits from all the events, special activities and FUN we have to offer. While our chapter's growth and retention rates were among the highest nationally last year - and our annual survey showed a high degree of member satisfaction - we are committed to doing even better this year. We particularly want to reach out to new members so that they feel welcome, understand the various events and have an opportunity to ask questions. So, what are you waiting for! 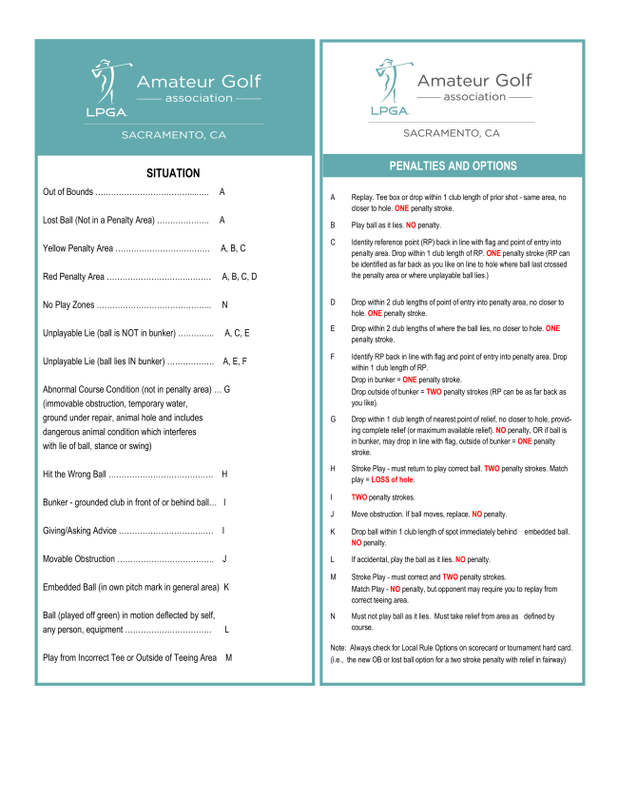 Email Pam Katros, Membership Director, at Membership@LPGAAmateursSacramento.com.